BANDAR-E ANZALI, Iran (Reuters) - Caviar fishermen know full well that the tussle with an irate, half-ton sturgeon can pitch one of their fragile skiffs into the icy, waves of the Caspian. Most have lost friends that way. Generation after generation still brave the elements to harvest the salty delicacy for which aficionados will pay $900 a pound. But the fishermen on the windswept beach at Bandar-e Anzali fear illegal fishing and oil pollution mean they could be the last to scour the Caspian for its "black gold." Aziz Rezaniaz, 44, has spent his life in pursuit of mighty "living fossils" that have existed for 250 million years. He agreed with environmentalists whose statistics say sturgeon stocks have slumped 90 percent since the late 1970s. "Every year the catch falls, in a few years there will be nothing left to fish," he said. Environmentalist groups say Turkmenistan, Kazakhstan and Azerbaijan have forsaken the tight fishing regulations of the Soviet era and done little to stop criminal gangs from ravaging the Caspian's sturgeon populations. 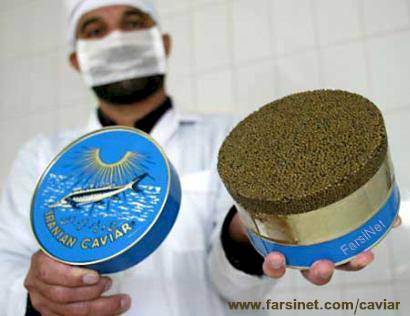 Fereidun Azeri, head of the caviar quality-control station at the key caviar port of Bandar-e Anzali, said the Islamic Republic was taking a hard line against such offenders. "When they are caught, they are fined three times the value of their catch, then face jail and losing their boat," he said. Pollution from Azerbaijan's nascent oil industry was also killing the fish, he added. "They seem to care a lot more for oil than fishing...God forbid the day when you cannot even swim in this sea." Iranian fishermen are paid a regular salary which Azeri said was an effective measure against overfishing. Sturgeon are true denizens of the deep, foraging off the sea bed. The exception is the mighty Beluga, prized for its buttery caviar, a predator that haunts the higher reaches. Although these long-snouted fish can live up to 100 years, their life expectancy has slipped to about quarter of that. Iranians are trying to combat the demise of the sturgeon with ambitious networks of hatcheries, designed to replenish stocks by releasing millions of young fish each year. Iran says it is releasing more than 20 million of the "fingerlings" annually, after rearing them in chains of ponds at research centers along the lush Caspian coast. Mohammad Pourkazemi, director of the International Sturgeon Research Institute, said the hatcheries and tough measures against illegal fishing suggested the tide was being turned. The U.N.'s Convention on International Trade in Endangered Species (CITES) has approved higher fishing quotas for the "Persian" sturgeon which live close to Iran's coast -- a move the Iranians see as a sign that their methods are paying dividends. However, quotas for migratory species such as the Beluga were cut and Iran still faces strong international criticism for the condemned practice of open-sea fishing. Pourkazemi said the status afforded to the industry was important in helping Iran turn the corner. "We consider this fish not only as a source of income but a matter of prestige ... like Persian carpets. The government is paying attention," he said. However, the future of sturgeon depends on the extent to which the Caspian will be opened up to further oil exploration. As a long-term goal, Iran has said it hopes to double oil production capacity from about 4 million barrels a day to 8 million by 2020 -- plans likely to mean tapping Caspian's mineral wealth. Pourkazemi said Iran would do well to work out whether over the long term a natural, continuous supply of caviar could not be as valuable as an oil grab that could wipe out sturgeon. "If there is oil pollution we lose a habitat for this species," he said. The sturgeon research centers are farming caviar on site, hoping to hit 10 tons of production. They are also beginning to extract a small amount through Caesarian sections that allow the stripped sturgeon to breed again. But saving the sturgeon may not be to everyone's taste. "It is a hard and dangerous job," said fisherman Sayyad Hormandi. "My children should go to university and get degrees, not stay in this place." From a Report by Christian Oliver, Tuesday Nov 18, 2003.